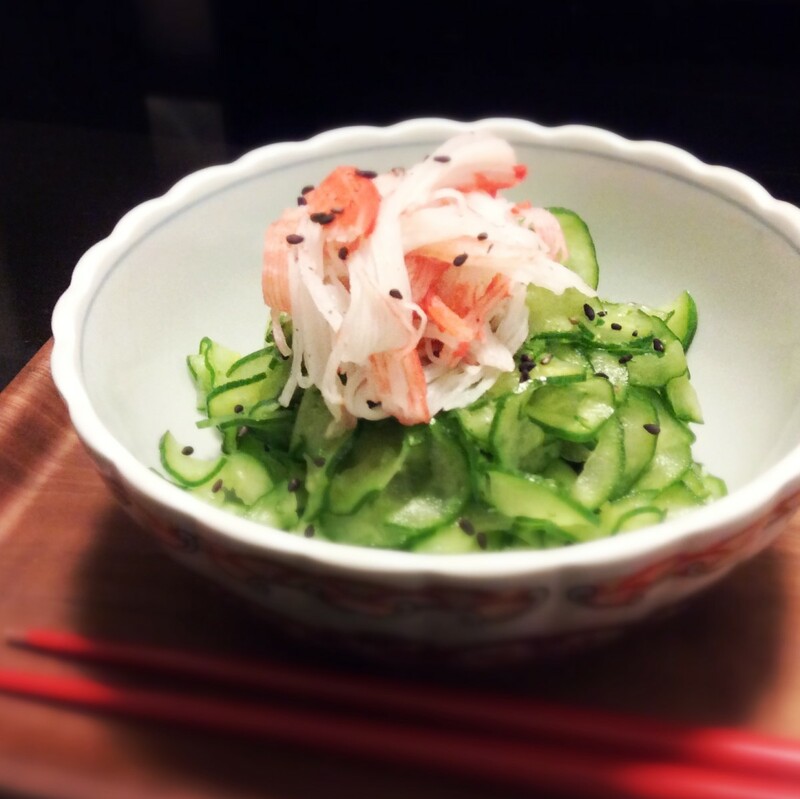 Here is a super fresh-tasting salad with a bunch of complementary flavors and textures. 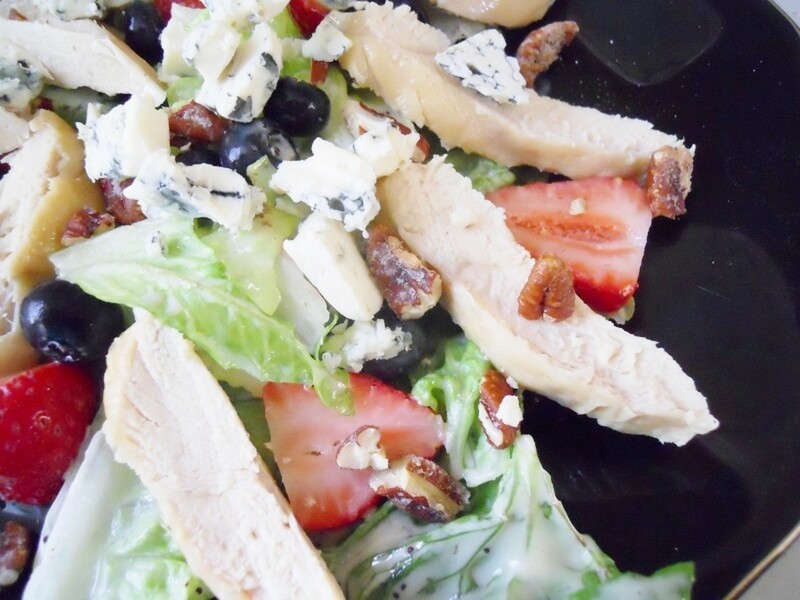 Crunchy fresh greens, sweet strawberries and blueberries, creamy bleu cheese, and honey-glazed pecans all enhance the flavor of the chicken. So many flavors. 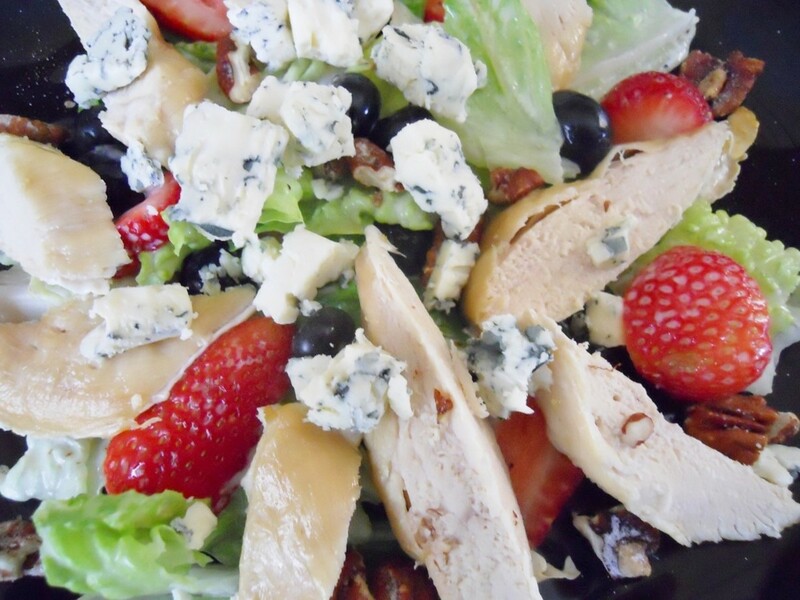 The strawberries and blueberries add brightness to the salad, while the bleu cheese adds a creamy/savory flavor. The sweetness and the soft crunch of the pecans is yet another layer and texture of flavor. I have to admit, this is not my original creation. 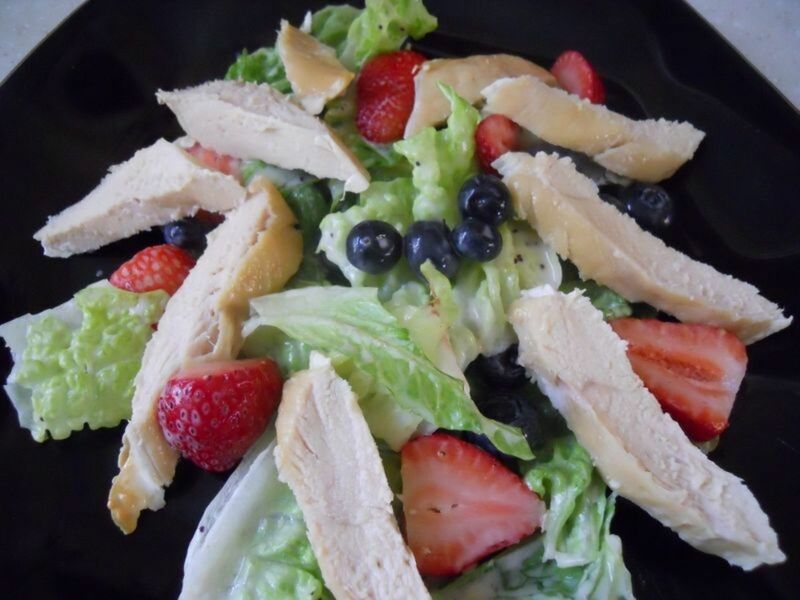 I tasted strawberry blueberry chicken salad at a chain restaurant and fell in love with it. 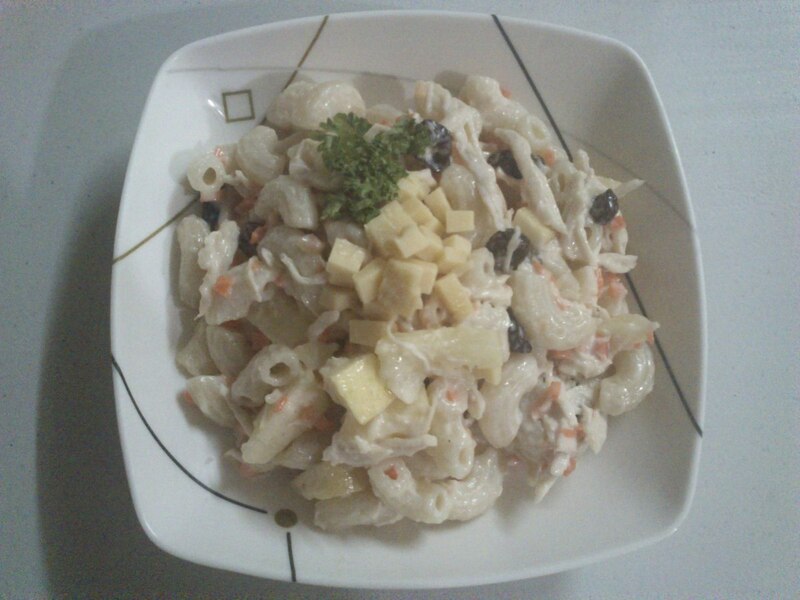 I was craving it at home, so I had to experiment and see if I could duplicate it. Happy day, I can! Now I can have this tasty treat whenever I want. 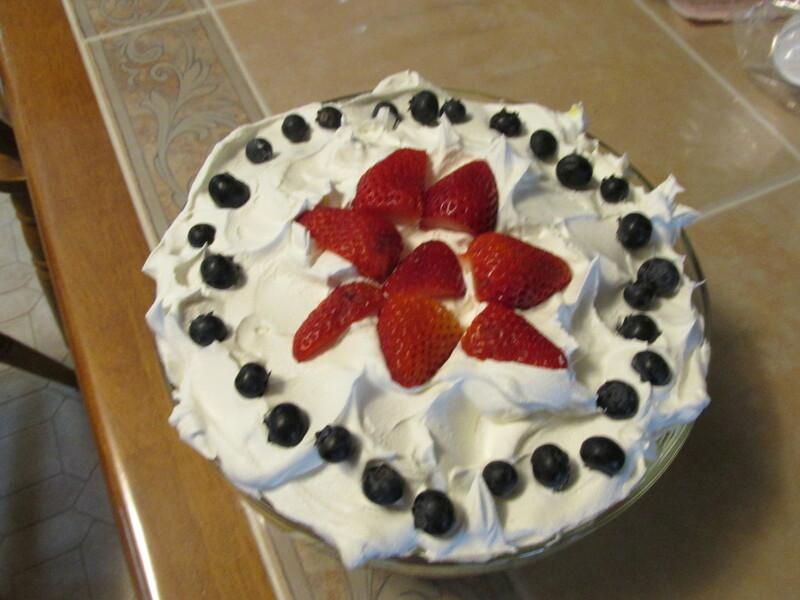 I made this with baked chicken, but my plans are to grill the chicken on the barbecue this summer. I think this will make a great dish for outdoor entertaining. The salad could be on the plates and ready as the chicken comes off the grill. A sprinkle of nuts and blue cheese. This is also a great way to use leftover chicken. The salad shown was made with Romaine lettuce. I like to use both the dark green soft top of the leaf and mix it with the crunchier light green hearts. 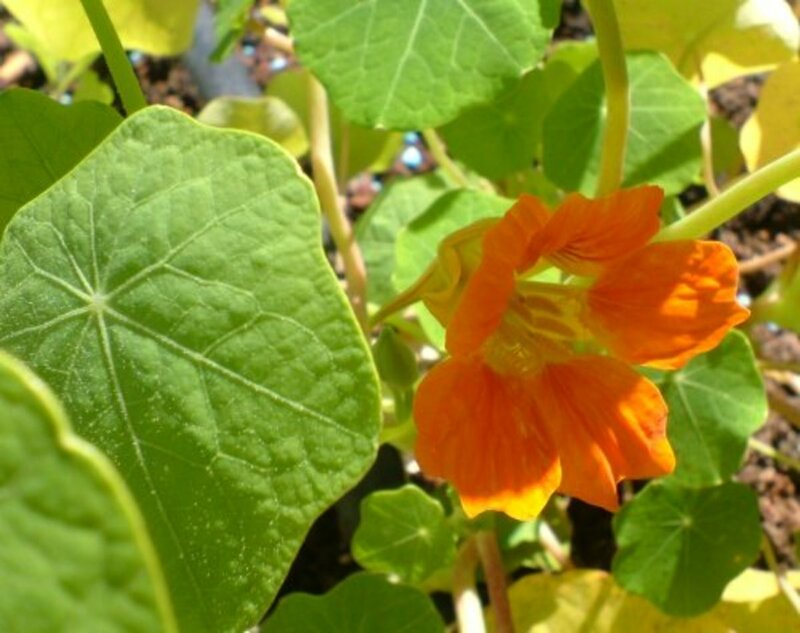 You could use what ever kind of salad greens you prefer. The chicken is the Perdue individually wrapped chicken breast halves. You could also make this with Gardein's Chick'n Scallopini to keep this vegan. For baked chicken, I put a little salt on the chicken and put it in the oven at 350 degrees for 15 minutes. Then I put it under the broiler for 7 minutes, just to give it a little color. This timing works for thin boneless skinless breasts. Thicker cuts may take longer. Meanwhile, tear or cut the greens and rinse. Wash the strawberries and blueberries. 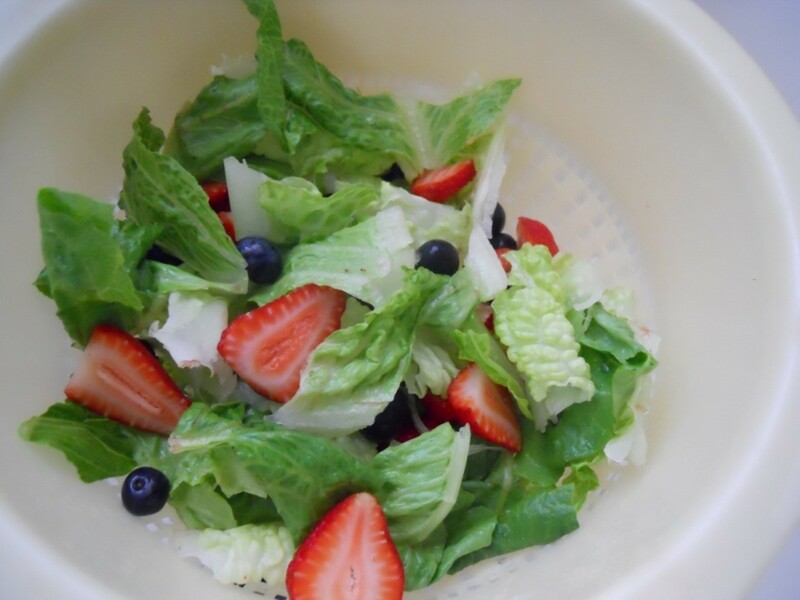 Slice the strawberries and put the berries and greens in a colander to drain well. 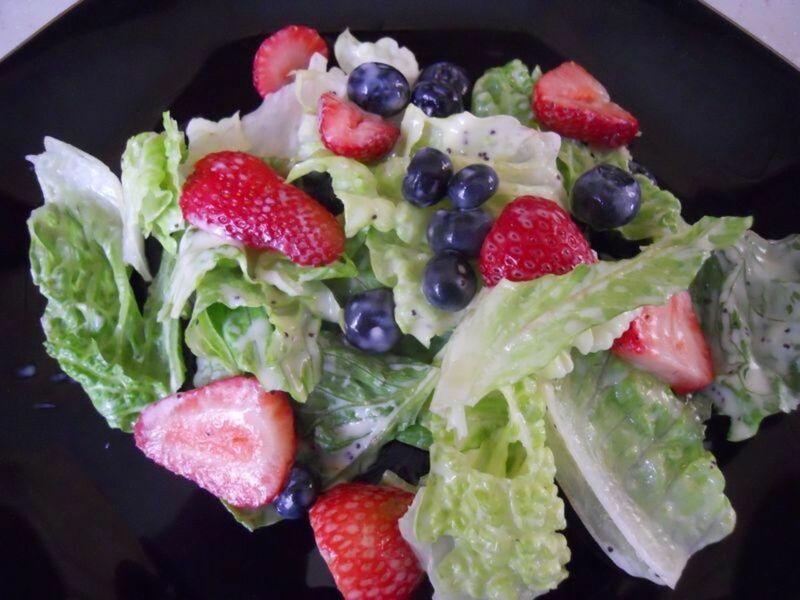 Shake the excess water off and toss the berries and greens with the poppy seed dressing. Place the mixture on 2 serving plates. When done remove the chicken from the oven. Let sit one minute to cool, then cut in strips and place on salad. Top with crumbled blue cheese and crumbled pecans. 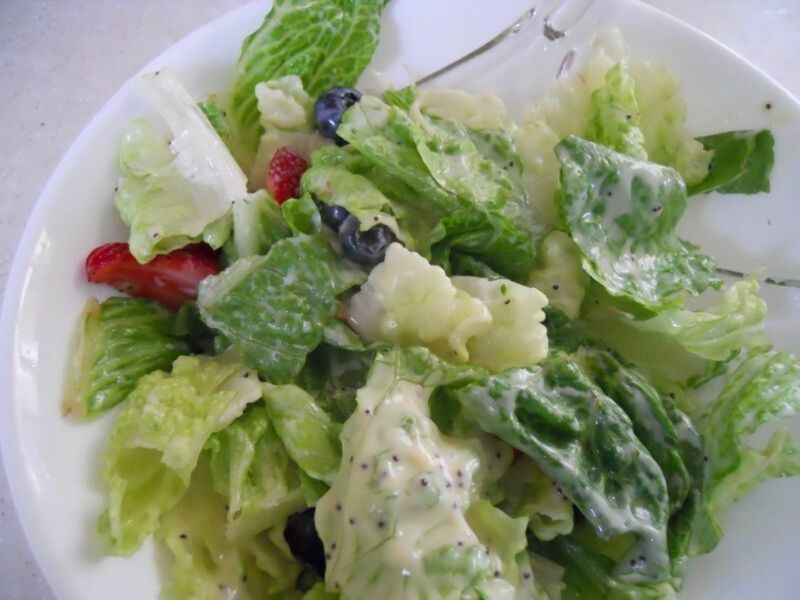 I like Newman's Own Poppy Seed salad dressing the best on this chicken salad. My second favorite would be Kraft Creamy Poppy Seed dressing if I can't find the Newman's Own. I have tried Olde Cape Cod Lite Sweet & Sour Poppyseed dressing and I found the flavor thin -- maybe because it was the "Lite" dressing. Yesterday, I ate a similar salad at a different restaurant. Their variation was they added a few thin slices of pineapple and some mandarin orange slices. They used regular pecans instead of the honey-glazed pecans. I must say, it was very good too. It looks good. I will be trying this as soon as the hot weather comes this year. This looks so yummy...I'm pining it to try, thanks! This salad looks wonderful. I can't wait to try it! Looks simply delicious and healthy. I would have to buy a couple extra cans of honey glazed pecans, as I am quite certain that buying just one would be a mistake! 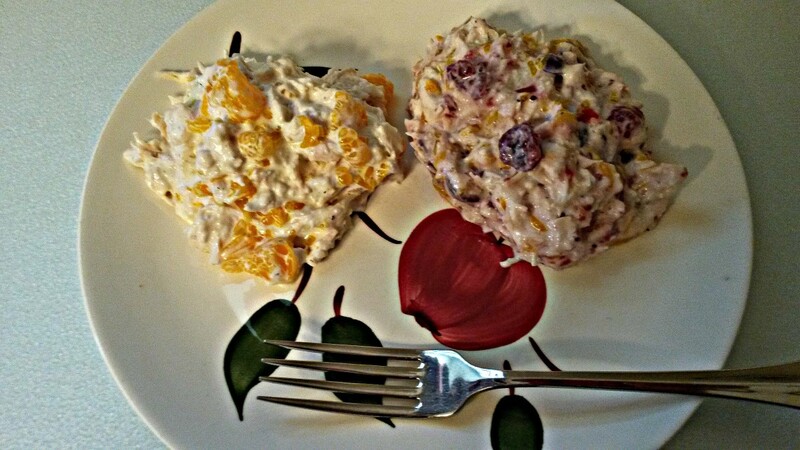 Chicken with dried apricots and cranberries is one of my favorite salads so this combination is especially appealing to me. Cool! 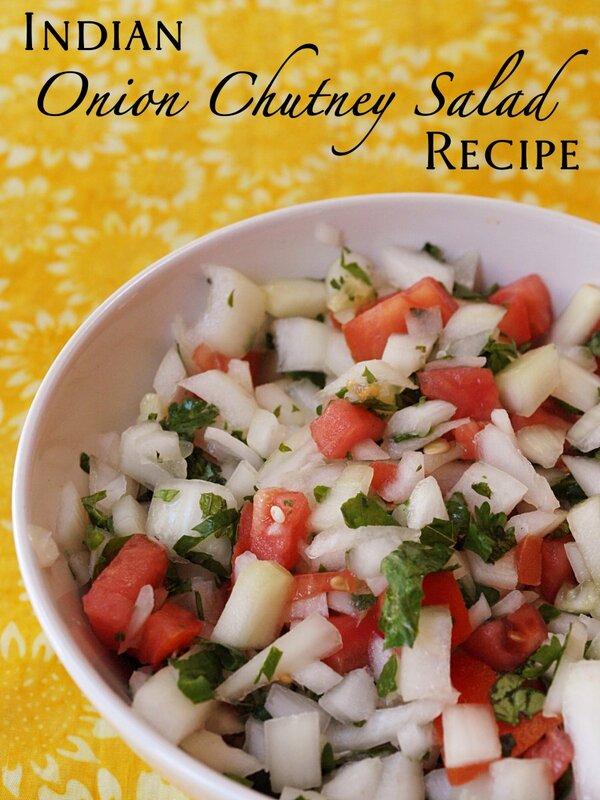 Love the idea of grilling the chicken and serving this with a barbecue. 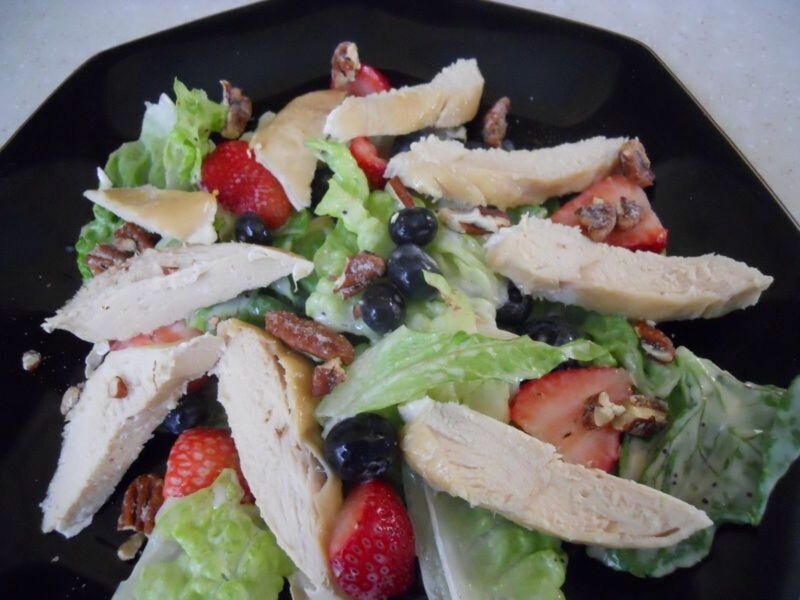 I love blueberries in salad, and my son's a big fan of chicken. Yum! I would never have thought to try this combination, but I know that I will love it. Thanks for coming up with your own version of the recipe for us. Can't wait to try it. Boy am I hungry now! I like a good salad and this one looks delicious. I'll try your recipe soon...thank you! Beautiful salad. 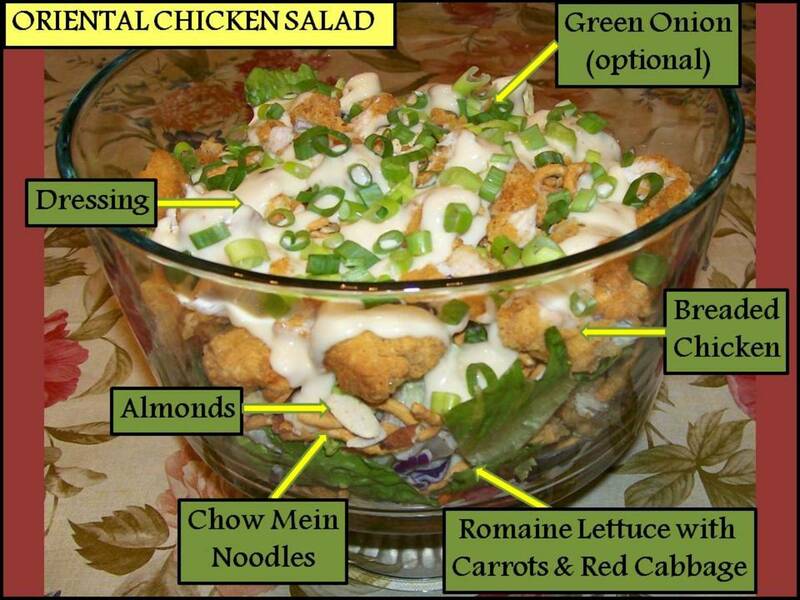 I make salads like this often, but without the chicken and with more salad veggies and they are delicious! What a healthy salad. This could become a favourite. A beautiful lens. 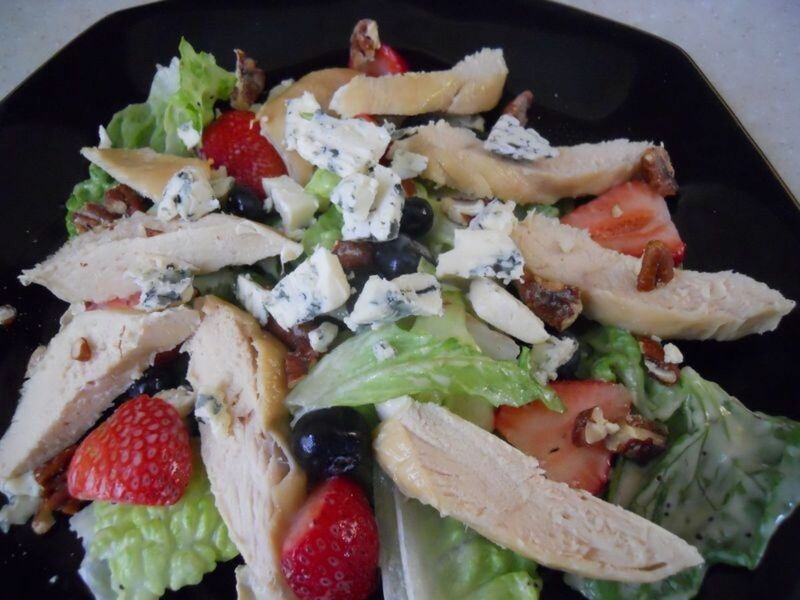 I never thought of a chicken salad with strawberry or blueberry. The image of the salad is mouthwatering. I am definitely going to make it salad next week!